I love beets – L-O-V-E! But make them? No, I used to be afraid of them; they look very intimidating. But, I got over it and now I am a pro. This is my basic beet salad. I make a batch at the beginning of the week and have it in the fridge to snack on all week. Cut off the stems and the hairy root of the beets. Try to get as close to the round bulb part as you can without cutting off too much of the goodness of the beets. Wrap them tightly in tin foil and place them on a baking tray on the top oven rack. Let them go for about an hour. When they are easily pierced, they are done. Most of the time I just assume they are done after about 50 minutes and then turn the oven off and let them sit in it for a little while longer just in case. When the beets are done (they will be easily pierced with a fork), take them out of the foil and rinse them off in cold water to make them easy to handle. Rub the skin off with your thumbs and fingertips. It should peel easily. 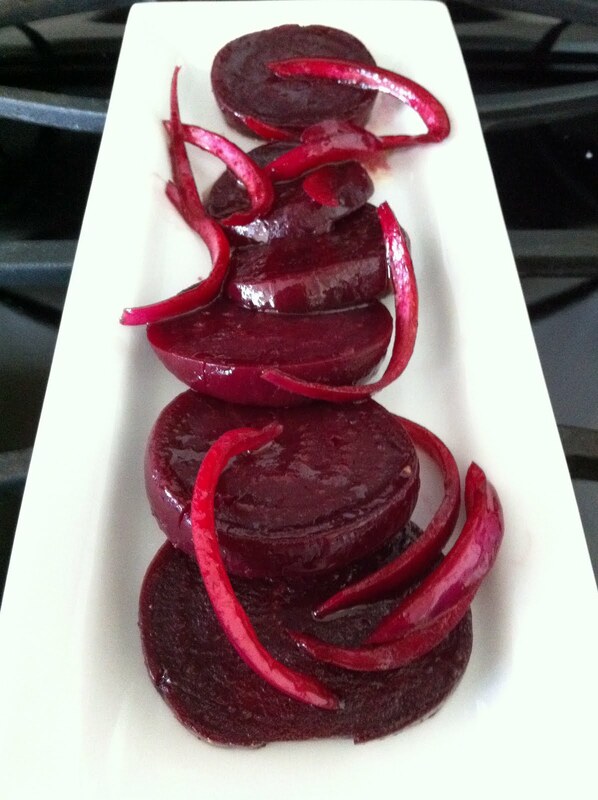 Slice the beets in rounds as thin as you want them. Slice the red onion thinly by holding the hairy part of the onion (this is the end that holds the onion together) and slicing. Place in a bowl (that has a cover) and toss with olive oil, balsamic vinegar, salt and pepper. Cover it and let it sit in the fridge for a while to let the flavors meld.